(Phys.org) —An old star, IRAS 15445-5449, has begun to push out a jet of charged particles that glow with radio waves. A few old stars are known to have jets, "but this is the first one where the radio waves tell us the jet is held together by a strong magnetic field", said Dr Jessica Chapman of CSIRO Astronomy and Space Science, a member of the research team. "That's a clue to what makes these jets switch on." The finding has been published online today [Monday 16 September] in the journal Monthly Notices of the Royal Astronomical Society. IRAS 15445?5449 lies 23 000 light-years away in the southern constellation Triangulum Australe (the Southern Triangle). 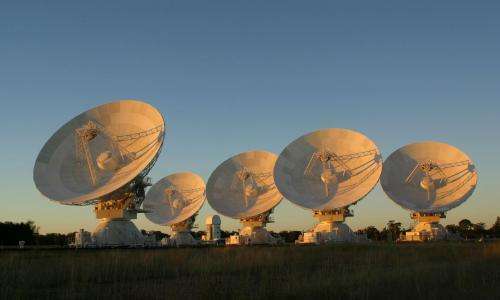 The radio waves from the star's jets were detected with CSIRO's Australia Telescope Compact Array, an array of six 22-m diameter radio dishes near Narrabri in New South Wales (eastern Australia). The flowering star is turning into one of the most beautiful objects in space—a "planetary nebula". Planetary nebulae are large glowing objects that early astronomers thought looked like planets. In fact they are stars late in their lives that have shed much of their gas into space. The shed gas glows, powered by energy from the old star's tiny core. Like Spring flowers, planetary nebulae blossom and go. 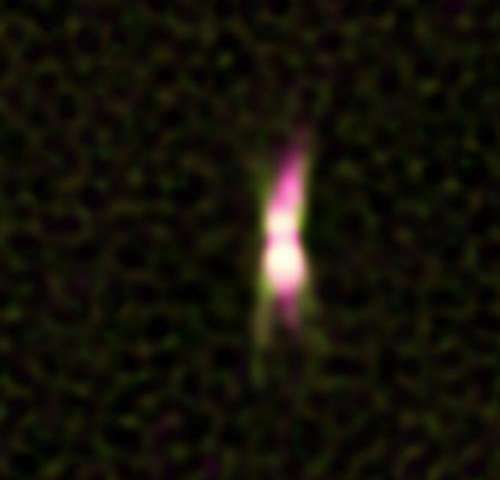 The "jet" phase seems to show the first stages of the star becoming a planetary nebula. This phase is just a "blink of an eye in a star's life," says Dr Chapman, "probably lasting only about a hundred years". Roughly half the known planetary nebulae are round blobs. The other half are long and symmetrical, often like a Christmas cracker. "The question is, what makes this symmetry?" Dr Chapman said. It could be that the outflowing gas is shaped by the presence of a companion to the old star—another star, or a planet. A second idea, which Dr Chapman favours, is that it's the magnetic field of the old star. "The magnetic field may get twisted up as the star shrinks, perhaps launching these jets," she said. But more detailed observations are needed to clarify how jets form. More information: Pérez-Sánchez, A. et al. A synchrotron jet from a post-asymptotic giant branch star, Monthly Notices of the Royal Astronomical Society. dx.doi.org/10.1093/mnrasl/slt117. Re: "The question is, what makes this symmetry?" Dr Chapman said. There is no sense to asking this question w/o talking about the context within which it is asked, for it is the paradigm itself which mostly answers the question. Those fluent in the traditional theories tend to rely upon a set of tools for explaining the things they see which, it turns out, frequently differs from the set of tools which laboratory plasma physicists use to explain laboratory plasmas. In this particular instance, even though both in this instance would suggest a magnetic field, the differing contexts suggest differing origins for the magnetic field. What will eventually turn out to be surprising for the public -- as they learn more about what a plasma is -- is that the more traditionally accepted approach being advocated by the experts is to generally assume the disconnection of magnetic fields from the electric currents which we generally accept cause them down here in our Earthly laboratories. Note the hourglass shape, once again a misidentified pinch along an interstellar Birkeland current. Magnetic fields cannot exist without the causative electric currents, magic does not occur in space. This is a plasma phenomena driven by EM forces, it's only mysterious for those who are ignorant of plasma physics, sadly as Alfven pointed our, astrophysicists are solidly in that camp. Birkeland currents such as this are coaxial, the direction of the flow is representative of the highest density currents only. You've posted this rubbish before. Note he talks of voltages of the order of 500kV but in a previous paper you also posted, he showed it was a few kV at most, he contradicts himself. Note he is not talking about I^2.R heating but a surface heating effect due to "cathode drop". The whole thing is just a mess of conflicting ideas stuck together with no real understanding. You are the one with no understanding, your comment about I^2 R heating shows that very clearly. "The whole thing is just a mess of conflicting ideas stuck together with no real understanding"
Actually, it sounds like an accurate descriptor of nearly all of Electric Universe/ Plasma Cosmology pseudoscience. Go on then, tell everyone what's wrong with my comment, let's see if you understand why there is a problem and how you would solve it. I don't think it's dawned on you or the original author that the "100-fold increase in the intensity of high-energy electrons" means - because it is a relative measurement between inside and out - that the solar magnetosphere blocks 99% of even the highest-energy electrons. In other words, you can't count 99 out of 100 as part of a current. Furthermore the paper once again suggests incoming polar electrons. As I pointed out to you in a previous discussion, http://phys.org/n...ry.html, Ulysses data shows that the direction of both protons and electrons over the poles is outward, not inward, and at an even greater speed than at the equator. The data was convincing enough that you changed your claim to incoming equatorial electrons, and identified it as the heliospheric current sheet. Then you started ranting off-topic. I don't think you understand the state of the art in heliophysics. Our present models certainly DO include the full effects of plasma, to the extent that our computers are capable of modeling it. Unfortunately, the system is far too complex to be accurately modeled, for now, but we do actually know that the model should include plasma physics. Indeed, our best models do attempt to include plasma physics, though the models are crude, and must include parameterizations (basically hard-coded cheats) in order to reproduce what we see. I think maybe your confusion stems from exaggerated attribution of cause. For example, in the story above the guy makes it sound very black and white, in term of a choice between magnetic cause or something else like a companion. In reality, he knows that it isn't black and white. Whatever the 'dominant' cause and effect, he knows that magnetic fields are in play either way. It's not 1 or the other, just which is primary vs secondary. Don't confuse the jets in the article above with the jets of an active supermassive black hole. The jets here are small and slow (not relativistic). The magnetic field present around this star would be similar to what our own sun produces, though you've gotta modify it due to all that plasma flowing away from the core. This won't involve relativistic physics, just simple forces and fields. I don't really like the way this guy explains it. It's probably easier to think of it like a thunder storm. Some storms self-organize to form a tornado. Some stars form these jets. We don't know why some do and some don't. We know magnetic plasma is involved, but we don't know the mechanism that makes some form jets while others do not. Seriously, a great rule of thumb: If you're not an expert in a field and you think you've thought of something the experts haven't considered... they've considered it. This really isn't that big of a deal. These jets only happen around certain size stars, and it only happens to about half of those. Additionally, it's only an extremely short duration event, as part of the star's transition to a white dwarf. The jets come and go in just 100 years. In stead of chargin into some ideological crusade over EVERY SINGLE ARTICLE, why don't you EU/PC/AWT guys just chilax for a minute. This kind of event is just a nice way to be able to see something we otherwise couldn't see. Since the plasma leaving the star is emitting radio, we can see it. Since it's plasma, it interacts with just about all of the forces at the same time. So, by looking at what the plasma is doing, we can measure and map the various fields and forces around this star as it becomes a white dwarf. The only problem right now is that we cannot see the plasma clearly enough to know exactly what it's doing. We can just see that there's two basic shapes that happen, shperical and hourglass. I don't think you understand the state of the art in heliophysics. Our present models certainly DO include the full effects of plasma, to the extent that our computers are capable of modeling it. Using "models we know are wrong". The full effects are absolutely not considered, the models don't produce many aspects of the plasma such as double layers. You can continue and lie about these things, but it's been shown repeatedly how the models being used are wrong. Fleet, it's not up to me to explain your ignorance, it's up to you to change that. Using "models we know are wrong". The full effects are absolutely not considered, the models don't produce many aspects of the plasma such as double layers. Our models of the solar system's current sheet and the double layer in the plasma field around Io are extremely accurate. We understand how the double layer behind Io is formed and sustained in great detail. You only think the models are incorrect due to the fact that you're looking at 50 year old models. Nobody in the field uses those any more. Our present day models are mainly lacking only in respect to small scale details like turbulence and vorteces, which are too chaotic to model in their entirety, though we know how they work and that they are really there. It's entirely possible to use a model that is incomplete, as long as you know what is missing, why it's missing, and what effect that has on your results. We predicted the sprials in solar flares before we could see them. That's pretty good. I can see the problem, you apparently can't, and since ignorance is a lack of information, that would apply to you. The problem with the paper is obvious if you think about it but I surmise you have just seen a result you like and don't care whether the approach is valid or not. If he was talking about I^2.R heating, it would partly go away (but not enough to make it viable) but speculating on a cathode drop effect makes it impossible. I don't think you have the faintest idea why he has screwed up, I'm just giving you the chance to show you aren't as ignorant as you appear. I'll bet I can guess the mistake without even reading the paper, in 20 questions or less. Would I be on the right track if I said that it has something to do with conservation of energy/momentum? Has he essentially created a perpetual motion machine? That's usually all it takes for EU/PC theories to crash and burn. Much simpler than that, where does cathode drop occur? That's a given, there is no source of energy in the EU claims. PC tends to be more about the role of plasma in astrophysics but the line between them is very blurred and few of the proponents could say where it lies. From the wiki page: "Thermionic emission is the heat-induced flow of charge carriers from a surface or over a potential-energy barrier"
I see several problems, now that I've given up and looked at the paper. First he's greatly underestimating the power output of the sun. By only estimating the power output at the photosphere, he is neglecting all the power needed to counter the gravitational collapse of the sun's mas. He should be treating the 'surface' of his cathode as the core of the sun. The output that reaches the photosphere and continues out as the solar wind would first need to overcome the resistance of the sun's interior. Second, he's treating the interstellar wind as a uni-directional flow, when it is actually more like an omni-directional pressure from all sides. The solar wind does 'work' on the interstellar wind to hold it at bay, it doesn't 'receive' energy from it. So, as I originally suggested, he IS creating a perpetual motion machine. We know that the solar wind pushes against the interstellar medium. In energy terms, this is 'work' being done by the solar wind. If the solar wind is doing work on the ISM, but the ISM is powering the solar wind, then this system is breaking the laws of entropy. Any such system where there is a two-way exchange of energy will seek to self-equalize so that the energy flow is one-way. For example, two objects cannot heat eachother. The warmer object will always heat the cooler object. Heat will not flow backward from the cooler object to the warmer one. Similarly, the solar wind cannot exert radiation pressure on the ISM, while simultaneously drawing electromagnetic energy from it. BTW, fluids will flow to equalize. And if the energy flow was positive rather than negative, then the heliosphere would not be stable; it would break itself apart and expand out into the ISM until the radiation presure equalized. 1) Sighting +50 year old, outdated work. 2) Using basic principles in situations where they don't apply. 3) Failure to understand how something they suggest will violate one or more basic principles. I must say that the guy behind the Hannes_Alfven account does a much more credible job at trying to foist this nonsense than Cantdrive does. At least Alfven seems to have some physical science education. Alfven (the poster) is a failed physics student. He has a grudge to bear against the "establishment". cantdrive is one of his devoted acolytes that he has attracted to his "program" of internet enlightenment. That's why they work as a team. Alfven (the poster) has collected a couple of them, but not that many considering the effort he puts into it. He was booted out his graduate program because of mental issues. I know this is a day late and a few dollars short, but thanks to Gwift7, FleetFoot, Q-Star, no fate, really! THANKS! that explanation yall posted helped me a LOT! I was thinking "perpetual motion machine" so, it is good to know I was on the right track. and it is too bad about Hannes_Alfven... were there no meds he could take? seems a waste of intellect to go from there to spreading pseudoscience. No problem, we all do what we can to combat the pseudo-science that floods this forum. That's correct in general but I didn't give away the answer for the cited paper. In it, the heat generated by "cathode drop" would be produced in the thin gas just outside the photosphere because the denser highly conductive layers would act as an electrode. We observe limb darkening because inner material is hotter but the paper's mechanism would predict limb brightening as the inner layers would be slightly cooler due to the radiation we see. It says a lot that he adopts the name of a dead crank as his pseudoname. Alfven a crank? That says everything one would need to know about the complete lack of scientific basis you're coming from. It's not at all surprising considering the magic you insist must take place with your "frozen in" fields. It was Alfven who first identified magnetic reconnection and that effect has been confirmed by observation. It was only later in life that he lost his way and decided to throw away his own valuable contribution and move over to the crank side.